Okay, so today I’m going to look at individual cards and their significance in my readings. I’ll basically tell you a few key words, then elaborate a bit on potential interpretations of these cards. Most of my system comes out of years of practice using playing cards for divination, as well as for games. I have found that in some cases, my personal work with a particular card has shown me a meaning different from the one I originally learned. When it comes to these sorts of fortune-telling methods, practice makes perfect. Remember that diamonds in general signify money, fortune, luck, and happiness. They also can relate to messages or news, or social interaction. Ace – A letter; A coin. The Ace of Diamonds indicates some new money or new information entering the questioner’s life. It can also have to do with a sudden shift in luck—if preceded and followed by spades, that could mean bad luck. Additionally, due to the solitary nature of the pip, it could mean being very careful with your news, luck, or money—keeping it to yourself, as it were. Two – Birds (as in “a little birdie told me”); Exchange of funds. This card is about sharing, whether that’s news and gossip (like the birds), or sharing your luck or fortune with someone else. It can indicate a partnership of some kind, but usually not a business one so much as a financial one. For example, if it were paired with a card connected to a friend or lover, you might be moving in with that person soon (because you’ll be yoking yourself to them financially). Three – Gifts; A fountain. The Three of Diamonds shows generosity—sometimes even unwilling generosity. Someone who draws this card likely “throws his/her money away,” just like one throws pennies in a fountain (if you’re singing “Three Coins in a Fountain” right now, I sympathize with you). This may seem like a sign of irresponsibility, but it can also simply receiving a gift, or an expansion of fortunes which allows the person to be generous. Four – The purse/money bag; No news. With the Four of Diamonds, the reader will need to figure out if the reading is about money or information, as it changes the card’s meaning a bit. If the question is financial, thefour indicates a stable monetary situation, but also one without any chance of growing—much like a closed purse neither receives nor spends money. In the case of information, this card indicates a dull waiting period, possibly a prolonged one. This can mean “no news is good news,” or that the client must wait on tenterhooks for a proper resolution to his/her situation. Five – Good luck; Laughter. This card shows the subject surrounded by friends, fortune, and happiness. It’s not the all-encompassing joy found in other cards like the Ten of Diamonds but it’s generally positive nonetheless. Depending on context, however, it can also mean something like “the last laugh,” and have slightly more sinister connotations. Six – Streets of Gold; Good decisioins. No, not the Yellow Brick Road, but the idea’s the same. The client’s on the right path and merely needs to continue doing what he/she is doing and success will come. Paired with a card like an Ace, this card may mean recent decisions have been good; paired with a King or a Queen the client is probably getting very good advice from someone. Seven – Lies; Deceit and falsehood. The Seven of Diamonds indicates that the questioner is being lied to by someone. This lie may or may not have to do with money, but almost always has to do with happiness. Perhaps the client is happy being lied to, and little white lies sustain him/her—this could certainly be the case if a Jack of Diamonds, Clubs, or Hearts were nearby. More often, though, the lies indicate trouble to come. Eight – Gossip; Idle chatter. Much like the Two of Diamonds, this card means an exchange of information, although it usually is information of little value. It can also indicate talking about money, getting good news about one’s fortunes or finances, or someone’s natural wit. Paired with something like the Two of Spades, it might mean something like “loose lips sink ships,” and that one should hold one’s tongue for a while. Nine – Daydreams; Peace and contentment. Think of this card as a leisurely day spent in the sun with nothing particular to do. It’s a card of relative idleness, but without any real negativity. It’s a well-earned rest, a chance to plan for the future, and time to stop and smell the flowers. Beware, though, if it’s paired with a four of any kind, as it may mean that all one’s plans are but pipe dreams, destined to disappear like clouds in an afternoon sky. Or something like that. Jack – Good news; A girl. This card displays a young boy (or possibly a young girl, hence the card’s alternate meaning). 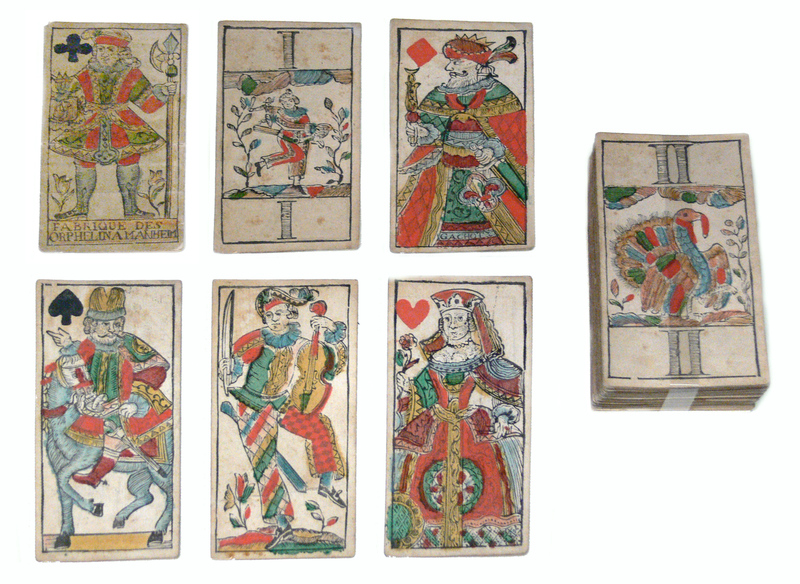 At one time these cards were known as Knaves instead of Jacks, and would have been similar to a knight’s squire. In the context of a card reading, this Jack means that some good news is about to arrive. Or that a beautiful girl is about to arrive. Which might also be good news, depending on your point of view. Queen – The good wife; A wedding; Sensuality. This Queen is all about duty and splendor. She could be a mother or wife in the questioner’s life who inspires joy and happiness, or provides sound financial advice. More likely, though, she indicates someone who does what must be done or a woman with a deeply sexual side. She can also mean a wedding (and thus a large expense and a large celebration), or in some cases a big party (for instance if she appeared alongside “friend” cards like the Queen or Jack of Clubs). King – A bank; A civil trial; Wisdom with money. The King of Diamonds means power through money or fortune. Pulled with several spades, the client can expect to face some financial trials (literally in a courtroom or possibly only figuratively). Alternately, pulled with clubs or diamonds, this card probably means that money is being invested wisely, or that there is a man in the questioner’s life who provides very good advice when it comes to luck and money. Clubs are work, destiny, plans and debate. Remember that as you do your readings. Ace – A cave; Solitary contemplation. This card tells the reader that the subject should take some time to really evaluate his or her life. Has he/she got goals? Is he/she working to reach them, or should there be some reevaluation of priorities. This is a lonely card, but not necessarily a bad one—often we need moments of intense personal reflection before we can move on to do the great things we are capable of. Two – A handshake; Business partnership. The Two of Clubs shows an agreement or arrangement made between two people, often for the sake of business or stability. It can indicate a treaty or alliance of some kind, or a pairing up to overcome obstacles in the way. Pulled with something like a Two of Spades, it may mean the impending end of a previous business partnership. Three – A stone wall; Obstacles. In most cases, threes indicate wishes or growth, so this card may seem odd. However, the setbacks provided by a good obstacle also provide the impetus to overcome them oftentimes. Usually this card means that whatever challenges the subject faces, whether they be business troubles or a lack of personal direction, he/she can and will overcome them. Paired with something like a Three of Hearts or Diamonds, such progress is likely just around the bend. Four – A horse and cart; A plowed field. This card is about potential. The Four of Clubs definitely means that for the moment nothing is happening, but that now is the time to prepare for inevitable change. By “tilling” and “plowing” oneself or one’s business plans, the eventual outcome will be far better than one would get just sitting on one’s hands. If this card appears with a Nine of Clubs, that outcome is ripe and should show up very soon. Five – A barn; A healthy body. The Five of Clubs is encouraging. It can represent either a full barn (which in turn stands for abundance and hard work paying off) or a strong, healthy body. If this card were at the end of a reading full of cards which indicated illness (such as a Five or Nine of Spades), a recovery should be expected. An inversion of that order might mean deteriorating health, however, so context is important. Six – Footprints; A clear trail. A person who gets this card in his/her reading probably has a definitive sense of purpose, or has recently begun some activity that he/she finds very fulfilling. This can be a career, a hobby, or even a friendship of some kind. If the appropriate King or Queen of Hearts comes after this card, it might be a sign that true love (“wuv…twue wuv”) is on the horizon. Seven – Doubts/Worries. The Seven of Clubs indicates that the client is very troubled by something. So troubled, in fact, that it is likely hindering or debilitating the questioner in some way. Paired with something like the Seven of Spades and/or the Ace of Clubs, he/she likely spends a lot of time alone and crying over something that he/she feels powerless to change. The nice thing about this card (and there is a nice thing) is that for the most part, all the troubles are really in the asker’s head. They can be overcome, but it may take a mental sea change to effect that change. Eight – Shop talk; A table or bench. When the work day finishes, it’s nice to crowd around a table with friends, family, and sometimes even co-workers for a drink or a meal. Often the events of the day get rehashed, with details added or subtracted as conversation directs. That’s what this card is all about. It shows people getting together to share the tricks of their particular trades, make plans for times ahead, or even occasionally plumb the mysteries of the universe, depending on how much beer is at the table. Nine – Reaping; A forest. The Nine of Clubs shows things that have grown and how we deal with them as human beings. In some cases, we reap what we’ve sown and prepare for hard times ahead, hoping that what we have will be enough. Sometimes, we wander through the trees getting lost, hoping we’ll find our way back again. A questioner finding this card may be having trouble making sense of his or her life, but there is still plenty of hope left. Followed by something like a Ten of Hearts or Clubs, this card simply means that a dark night soon reveals a bright dawn. Ten – A herd or flock; Clouds. This card is abundance, completion, and satisfaction. It is definitely all about rewards, comfort, and a job well done. It completes the sense of accomplishment found in the Five of Clubs, and adds the element of restfulness. The seeker’s found his or her calling, home life is happy and stable, and/or business is steady and fulfilling. The clouds, heavy with rain on the horizion, are pouring down copiously. This is the “pat on the back” or “Miller time” card. Jack – A friend; A sibling. The Jack of Clubs is a peer, whether that’s a co-worker, a good friend, or a sibling. This is someone with whom the questioner has a mutual respect. The Jack can also indicate business news of some kind (especially if an Ace or Two of Diamonds or an Eight of Clubs shows up), and may also indicate a young boy entering the client’s life. Queen – A mother; A nurse; A wise woman. This is a card indicating someone very smart, very strong, and very helpful. The seeker probably knows exactly who this card represents when he/she sees it, and also probably knows exactly what kind of advice this person would give (think of this as a conscience card). This card can also mean a mother hen, too, though likely only if connected to an argumentative card, like the Eight of Spades. Conflict in the Clubs is productive, however, so even a mother hen has her place. Finally, this card indicates nurturing. Paired with something like an Ace of Clubs, it likely means taking the time to heal old emotional wounds before moving forward with something or someone new. King – A father; A judge; A general. The King of Clubs is someone with authority, someone who can give an order and get things done. He may not always be nice about it, but he has his reasons for driving people so hard. This person is someone wise, though perhaps also someone very stubborn and set in his ways. For those who have issues with feeling judged all the time, this card could be troubling, but it may also mean that the questioner must face his or her fears and forge ahead. This is a card about what must be done, and living up to expectations. This entry was posted on August 26, 2010 at 9:30 am and is filed under Blog, Practice & Technique. You can subscribe via RSS 2.0 feed to this post's comments. Anyway, I’m certainly getting a lot out of these posts. Very informative.